Schrade Frontier Extreme Survival Full Tang Fixed Blade Knife | BUDK.com - Knives & Swords At The Lowest Prices! Tackle your outdoor chores with this tough Schrade blade! This Frontier extreme survival fixed-blade knife features hefty full-tang 1095 high carbon steel construction with a black powder-coated finish. The textured TPE handle provides a rugged, slip-free grip with spine jimping. The exposed tang of the blade has a pre-drilled lanyard hole for on-the-go use, and a black nylon belt sheath complete with a ferro rod and sharpening stone is included. The 5" blade makes quick work of all your smaller duty slicing, cutting and light chopping needs, and the sturdy construction will withstand the test of time. I bought this for my son as a Christmas gift and he loved it , Loved the feel in his hand and carries it in his car for his Emergency kit. Just received my SCHF. Full tang fixed blade knife. All I can say is (WOW). This thing is built like a tank. A really good deal and caution! It is very sharp. The fire starter and sharpening stone clinched this deal for me. Don't think about this knife just BUY IT, you will like it. Thanks BUDK. I stripped the "anti rust coating" forced a patina upon the stripped blade using a mixture of guldens mustard, lemon juice, and vinegar, and am pleased with the results. It came sharp AF, anyone who complains about the jimping, yeah it sucked, nothing is perfect, some tennis racket tape fixed that, added a paracord lanyard, the sharpener and fire steel are great, good sheath, no complaints, if you have a will and a way to make it your own. I am simply amazed at this knife, it was bought as a gift for my camp gear set up and it is a truly rugged addition. A true 90 degree spine makes fire steel usage a snap, sure you have to wear off a small section of the oxide finish to make it easier to use but that takes less than half an inch off the spine of your blade. I have not used it to actually hit the woods yet but I have tested it out around the house, batoning and cross batoning both work well and with a little work on the edge it will make feather sticks without a problem. Holy Cow! I bought this knife as more of an afterthought with my other purchases and I am glad I did. This knife is of fantastic quality! This has to be the best knife I own. My son & I were looking for a survival/camping/hunting knife when we saw this on line & decided to take a chance. The Schrade SCHF36 is all it said it would be and more. We have already put this knife to "use", including to gutting, skinning & processing several deer. It's still as sharp as the day we received it. If I could only own one knife this would be the knife!! Schrade gets a 10 out of 10 for this knife. We can't think of anything we don't like about this knife...oh wait...it's a little big to carry to work every day... but wait...we already have any every day carry knife. This knife does every thing else. This is definitely the best knife purchase of my (62 year) life. I recommend this knife to anyone who goes outdoors, it is the best tool to carry outdoors bar none. Thanks BUDK !! 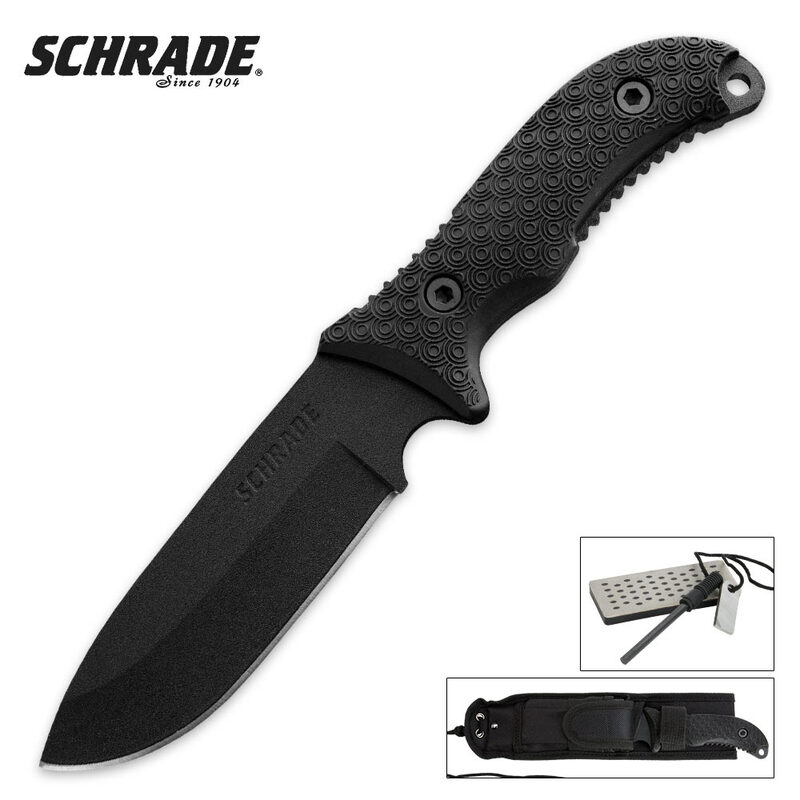 Schrade Extreme Frontier Survival SCHF36 Purpose: Survival/Outdoors/Hunting/Medium-Heavy Cutting, but, short of surgery, there isn't much that this knife isn't well suited for. Ratings out of 10 Blade 10/10 Handle: 9/10 Edge: 10/10 Sheath: 9/10 Durability:10/10 One word..... WOW! Schrade really went all out when they designed this knife. It is one of the most versatile and well made blades on the market. I can say, with no hyperbole, that you'd be hard pressed to find a knife this good at three times the price. The worst features of this knife fall under the heading "pretty darn good", the rest, I'd consider superb. Lets start with the blade. Like any true survival knife should, this one has a full tang, carbon steel blade. It has a tough, black coating to inhibit rust. Out of the box, this thing is sharp as sharp gets. You won't need to do any prep time in before putting this thing to work. The blade is a good length, and thick... and I mean THICK. It handles any kind of slicing, batoning, hacking, or piercing you throw at it. I'd even say the blade would likely stop a lighter caliber handgun round. The edge holds well thru repeated use while resisting chipping and nicks. The blade is a great working length, and the width almost makes it seem like you're working with a small, well designed cleaver. It will stand up to rough outdoor use, while also has capability to be a great hunting, skinning, and self defense knife. A finger notch at the base of the blade makes for All around well made. The handle is very comfortable with a nice contour. The blade scales are attached securely with two hex head screws. The texture of the scales takes a little getting used to, but don't detract from the overall feel of the knife. The scales themselves are a bit rubbery and help take some of the impact out of chopping. The thumb grooves on top along with the underside ones that run middle thru pinky give a very secure grip, especially when your hands get sweaty working or get wet. The grip length is perfect for man-sized hands and has a solid lanyard hole at the end. 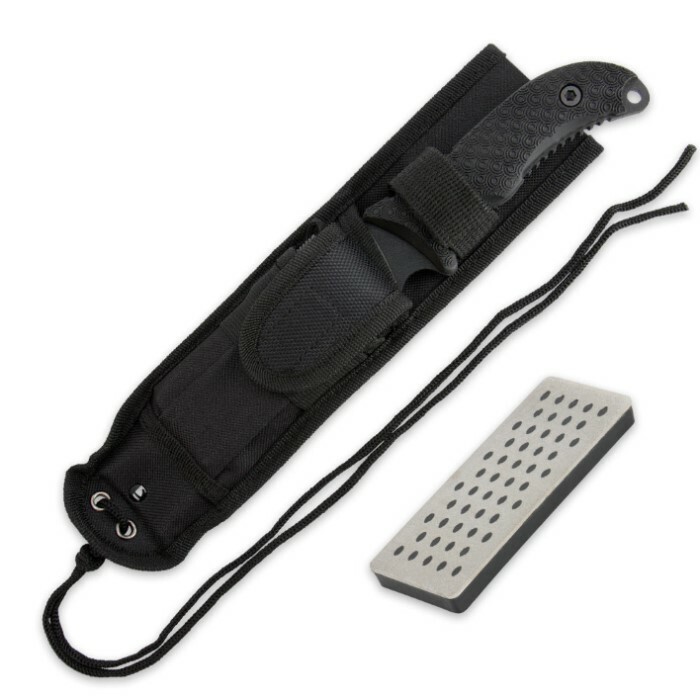 The ballistic nylon sheath is well put together with a hard, plastic insert inside to protect the blade. There is a small accessory pouch permanently affixed to the front of the sheath that holds an included ferro rod and striker and a knife sharpener. The included sharpener isn't a cheap, flimsy whetstone (see: every Rambo knockoff survival knife you've ever bought), but a decent sized diamond hone which fits snugly in the pouch. There are two holes at the bottom for use with the included lanyard (removable if you wish). The belt loop design Schrade uses is a clever setup. You can feed your belt thru like a standard belt loop, or you can pull apart a generous sized piece of heavy duty velcro, loop it over your belt, and reattach it without having to take your belt off. Will fit up to a 2 inch belt. If there is one thing left to be desired for the sheath, it's the lack of a Molle-compatible loop on the back which is offered on other Schrade survival knife designs (certainly not a deal breaker by any means, but would be nice to have). The knife is held in with a vercro adjustable loop with a snap closure. The outside of the snap is covered by the loop material which is nice if you get clumsy and brush up against a wall/your car, ect. The accessory pouch is the same ballistic nylon material with a wide elastic over it to hold the contents in place within, with a good sized flap and velcro closure. I'm a multi-generational knife collector with a good deal of blades, and I can say, with all seriousness, That this will be my go-to knife for everything. Buy one, and i'm sure you'll agree. All this for under 30 bucks..... This is a deal you can't miss! I'm currently buying three more for gifts. At this price you can buy one for your hip, one for your car/go bag, and one to give away to a friend who cold use a good, fixed blade knife. They'll thank you for it. Stay sharp! "13"
They call this a budget survival knife and it is true that it is not a two or three hundred dollar knife but I have checked it out pretty thoroughly and I have no doubts that this knife has everything I want in my hand if things go south and for people like me it is something I can afford and still get the job done every bit as good as the top dollar knives. Very nicely priced survival knife with extras. Sharp given the blade grind, likely designed for rugged survival use. Impressive rubber scales to absorb the shock of batoning. It ain't a Randall, but for the coin it's an excellent knife for the bush. Five stars.